The screening will be followed by a discussion among expert panelists who have been involved in recent field efforts to protect the critically endangered vaquita, a small porpoise that can only be found in the northern waters of the Gulf of California, Mexico and not far from our desert home here in Arizona. Acoustic monitoring programs indicate that fewer than 30 individual vaquitas remain in the entire population, which is threatened by fishing activities and an illegal trade in the swim bladders of totoaba, an endangered fish species which shares the vaquita’s home in the Gulf. This will be the first public dialogue with individuals directly involved with vaquita conservation, including experts from the recent Vaquita Conservation Protection Recovery (CPR) efforts that ended in December. Please join us for this important global conversation as we explore the lessons learned and whether there is still hope for the vaquita and other critically endangered whale and dolphin species. The vaquita is the world’s most endangered marine mammal with fewer than 30 individuals remaining on the planet. This small porpoise is found only in the Northern Gulf of California and researchers have predicted that without a dramatic effort to protect them, the species could be extinct by the end of this year. In April of 2015 Mexican president Enrique Peña Nieto announced a ban on the use of gillnets throughout the range of the vaquita. This was an unprecedented action that was applauded among marine conservation circles all across the globe. Gillnet entanglement is one of the leading threats to marine mammal populations all across the globe, and researchers and conservationists were hopeful that this action would prevent the extinction of the vaquita, and set the standard for future marine conservation efforts. Now, two years into Mexico’s ban on the use of gillnets, the situation faced by the vaquita has taken a dramatic turn for the worse. Attempts to stop the use of gillnets have been stymied by the illegal fishing for another endangered species, the totoaba. The totoaba is a large fish species whose swim bladder is highly prized on the Chinese market. It is this demand for the swim bladder of the totoaba that is currently driving the vaquita to extinction. Souls of the Vermilion Sea explores this crisis situation faced by the vaquita, the totoaba, and the communities of the upper Gulf of California. 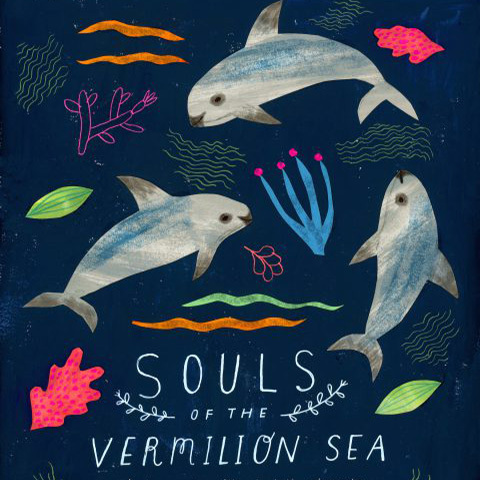 The film explores a multifaceted approach towards bringing the vaquita and the totoaba back from the brink of extinction from the unique perspective of one family that has chosen to take a stand for conservation.